8 Days/88 Acres Day 6 "What are you not?" I now have only 2 days left here, and have mastered the coffee making. It has been hot, like 90's hot with high humidity. The skies this morning are gray and there is a bit of morning fog out on the prairie. After my breakfast I head out to check on the puppies. All of them now have their eyes open and have started to try to walk. It is adorable and amusing at the same time. You realize how vulnerable these little creatures are as they begin to navigate the world now that they can see. The goal is still to find their mother and nurse as much as she will allow. Their bellies are getting rounder and more pronounced. I take turns picking them up and nuzzling them. This is one of my responsibilities, to socialize the pups. However, what I have also discovered is that holding puppies is a good kind of therapy. They smell like sweetness, their fur soft as flower petals, they are warm and enjoy being held. It is a fairly uneventful day so far, chores done and after lunch we head out to the pool with taquitos and water bottles in tow we're set to cool off and hang out. After about an hour or so there, the winds pick up and clouds roll in and the skies blacken; lightning happens. They clear the pool and we leave. Storms roll in as we pull up to one of the girl’s friend’s house. We hang out there while things subside. Back in the car we make the trek back to the farm. Everything looks intact. The girls and their friend are busy playing, while I am cleaning eggs and preparing for dinner. As I prep dinner, I start to think about what I have learned each day that I have been here: more acceptance, trying and learning something new everyday, letting go of control, letting go of outcomes, learning from kids, learning from the animals. After dinner my friend who owns the farm calls and checks in on me. "So has the novelty worn off yet?" I start laughing and tell her "I have never thought of this as a novelty, this is a lot of work and I knew it would be and I am still enjoying it." Later in the evening after the girl’s friend has left, the rains came in again and we decided to do more painting. We had an enjoyable evening of pop music and painting while in the solarium room, that is until the next song on the playlist came on and it started out with a sentence full of expletives! Both the girls looked at me and I was caught off guard and they were waiting for my reaction. I skipped the song and started laughing saying their mom would probably not let me care for them again. Then we all started laughing hysterically which made the one girl decide to do yoga. As younger girl started doing yoga she told me "this is cow and this is cat." My uncle taught us how to do yoga." 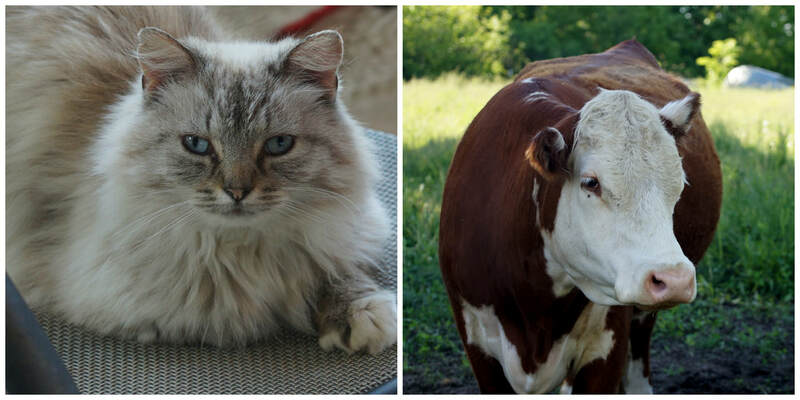 Nice, I said, "but the first one you did is cat, and the second one you did is cow." No it is not she insisted. I tried explaining to her the difference, then I finally said "here's the thing, I am a certified yoga instructor and I know the difference between cat and cow." They both stopped and looked at me, and older girl says "What are you not!?" We all busted out laughing and I told her that that was the best question I have ever been asked in my life! The evening continued to be enjoyable and silly. I start to fall asleep and my thoughts trail off to wondering if my eleven year old self would have benefited from these words. I don't know, but it is likely that I may not have believed any of it, or even listened. I would have been my eleven year old self just beginning to wake up to the world ahead of me. It is Sunday, the day of rest, unless you are on a farm. I slept in until 6:00 and decided to stay in my pajamas and flip flops and drink coffee out on the deck. I nailed making the coffee this morning on the first try and wah-lah, coffee happened. I headed out onto the deck with coffee and cell phone in hand. As I closed the door I heard a loud and close by "Mah! Mah! Mah!" I turned around and there was one of the lambs. Choco-lamb as I call him, was outside of the barn standing there calling out to me but actually for its mother. I began walking over to the lamb trying to figure out how the heck he got out and how the hell I was going to get him back in?! My outfit was an instagram moment for sure as I was wearing all the wrong things for dealing with farm animals. I've got on pajamas, robe and flip flops, not in the best position to be doing this work, but I didn't want the lamb to take off and run away either, so I risked stepping into all kinds of animal feces, and stepping on or potentially falling into God knows what. Tetanus shot? Check! I started getting pretty close to Choco-lamb until he ran over to the entrance of the barn which was locked, so I knew he didn't get in that way. As I tried to coax him into the barn, he was having none of it and literally jumped 3 feet off the ground and ran around and into the side barn area that he clearly escaped from. Of course being a dog owner, I told the lamb to "stay, stay, stay!" As I entered the barn laughing at myself I opened up the door to the lean-to and there were zero sheep in there except for Choco-lamb. Also, there were no sites or sounds of sheep anywhere, no wonder choco-lamb was crying. His mother was lost and he was separated from the herd. At this point I realize I have probably lost an entire herd of sheep and I'm wondering how I will explain this; my laughter is gone and my adrenaline is high. In the meantime with choco-lamb back in the barn, I walk then run into the house and upstairs to wake up the boy. The boy says they are out there, probably on another pasture. I tell him he needs to get up because I can't see them on any pasture! As he's telling me it is fine, I am in the other room throwing on clothes and running out the door to find where the sheep are. The boy is already down there as I catch up with him. He maintains they are out there. He starts climbing the big gate and so do I.
I climb three big gates in succession. Yes! I still have gymnastics muscle memory, contrary to what my inner thighs are telling me as I swing my legs over. ​ We walk the pasture and it is silent, this is not good, we continue walking, though now uphill and he says "See, there they are, the electric fence must not be on, they crawled under the fence to get into another pasture." What other pasture? I didn't know that there was another one. It all looks like just one big area to me. Choco-lamb runs back out to his mama, and now all of the sheep see us, and they start running towards us, first en masse, but then they form a single formation which is so fascinating and humorous at the same time. They are all calling out "mah, mah, mah". I asked the boy what do we do now? He says "they will just run past us, they think we have food, I'm going to go turn on the fence." The boy is right, single file they run past us, including the lambs. The boy is so calm and knowing, as if this happens everyday like the sun coming up. There is no freaking out that is visible in words or manner. At 13, he is already more capable than most 18 year olds who leave home. I cannot stop talking because I am so thankful that the sheep were not gone. It's amazing how the mind creates stories, and my mind is wonderful at coming up with very dramatic life threatening scenarios. The boy teaches me how to turn on the fence, you just plug it in and check the voltage. I thank him and tell him to go back to bed. It is now 6:30 am, my coffee is cold and I don't care. I pick up my 23 year old Starbucks thermos tilt my head back and drink the whole damn thing. Somehow the java counters my adrenaline rush and I relax. I call my husband and tell him the whole story, we are both laughing and all is well. Everyday that I am here, I am learning new things, and being challenged physically, emotionally, mentally and spiritually. I'm sleeping very deeply and soundly. My take away each day is lots of gratitude for this place and these experiences. I continue to show myself what I am still made of: physical strength a capable mind and a spirit that is still interested and ready for the adventures that life keeps providing. I woke up at 5:00 today a bit earlier than previous days because today is a big day. Older girl has three back to back soccer games in town. “Soccer Jamboree” they call it and we need to get her on the field by 8:30 which means leaving at 8:00 and all the chores need to be done before we go. It is also going to be 95 with gusty winds and we need to make sure that the animals all have enough water and cool water at that. Tonight my husband and youngest son will be coming out for a visit as well. It only takes me three tries to get the coffee made, progress is happening! I let the farm dogs out and get busy doing some of the chores to help the kids out and for us to leave on time. I check on the puppies and their eyes have begun opening. They are warm and sleepy and I can tell that they are getting bigger just by holding them. I check for eggs and there are only a few and I suspect that the heat is causing them to produce less. Cats and chickens are fed, cows have plenty of water, pigs are fed and they have plenty of water too. I now give the pigs fruit in the morning as a distraction for me to get their other food ready. Today one of the mostly red piglets was noshing on cantaloupe and made the cutest smacking and munching sounds of enjoyment while she ate it. It was very sweet to watch and listen to her munchings. I go to the house and wake up the girls, they pop out of bed and get ready for today’s outing, Younger girl checks on the puppies and older girl makes sure the lambs have access to water and the lamb is bottle fed. We are taking care of the dogs this morning as the boy is overnight camping with a friend. We feed and water the dogs and play with puppies. After about 20 minutes we get them all back in their kennels which is when we notice that two of the dogs are missing: Big farm dog and one of the kennel dogs who is older and deaf. We start calling out their names but they do not come back and only big farm dog can hear us anyway. We have 20 minutes until we need to leave. They are nowhere to be found but we think we hear them off in the distance. 10 minutes pass and still no dogs. We decide to split up and search for them. I take off for the far back corner of the land which I am not familiar with and younger girl follows behind me. We get pretty far on the path when suddenly I hear the screams of the older girl. The younger girl starts running back to the sounds of her sister and that scream is the type that makes a mother’s heart skip a beat and run towards it. I have not run for several years, and thankfully my feet and legs do not fail me as I sprint down the trail yelling that I am coming. I only do this once so as not to waste my energy. I run for what feels like several blocks and find the girl now dragging the big farm dog by the collar on its way to the garage. Older girl is mad. She says that big farm dog had the elderly dog pinned down and wouldn’t let her up and so older girl took the matter into her own hands. The belief is that there was some nasty smelling kill that big farm dog was hiding and the elderly dog found it. The other belief is that big farm dog was showing that she is top dog! We kennel up the elderly dog, load up the car and I use my new found skills of driving on gravel as we fly down the long driveway to the road. We made excellent time (only 2mins late) and drop her off while we find a place to park. We park far away and walk more than seven soccer fields, tons of kids, parents and cars . It sunny, cloudless, hot, and windy, at 8:32 am, and I am surviving on ½ a cup of coffee due to the adrenaline rush of sprinting for several blocks. The younger girl and I stay for the first game, and watch their team win. In the second game, a player on the other team collides with older girl and essentially kicks her in the ankle. She is injured and on the ground and then helped up as she hobbles over to sit down while the coach puts ice on the ankle. She is out for the rest of the game. I go over to her to check on her. She is strong, brave and wants to be supportive of her teammates and decides to stay. I say okay and step back heading over to where I was seated. I watch her and my heart aches because I see her pain and discomfort knowing she probably just wants what all kids want during these times, their mother. Her team loses the 2nd game and they have an hour break until their 3rd and final game. It is so hot and windy that I succumb to getting all of us snow cones probably made with high fructose corn syrups. At this point I really don’t care because we need something cold and refreshing and plain cold water does not appear to be an option. We are also all starving, and I am close to being “hangry” (which means hungry and angry). The girls want truck food: Maria’s Tacos. Yes, yes, that is what we will do! I’ve never had truck food before and we all get tacos; fortunately they also had chicken ones which were amazing; I got mine loaded with goodness while the kids got the basics. Hot Tacqui’s are thick short corn chips in the shape of what can only be described as bouquet shaped and about the same height as pretzel sticks. They are covered in hot spicy flavors of chilies and lime, highly addictive even though you can only eat 1 at a time and only so many at a time until your fingers are a color of red that you only see deep inside of a red zinnia flower. Your mouth is burning but your tastebuds are happy and crave more. I have been eating them everyday, one at a time and only a few at a time as I am pacing myself while I adapt to the spices. With Tacquito’s in the trunk we head back to the land of soccer fields and parking is worse than when we left. The older girl was on the field for a bit and then back on the sides. The game ends in a tie and we load up and head back out to the farm. Back at the farm, the boy is back, and in just a bit my husband and son are going to arrive for dinner. My husband and son arrive and I am so happy and overcome with how much I miss them. My son looks like he got taller in the 4 days that I have been out on the farm and I hold back my tears and just squeeze him and my husband. Next thing I know they head out with the boy and all three pick up their bows and start target practicing. I watch them for just a bit while dinner is cooking. I especially watch my son because he is using my Grandfather’s bow. ​My Grandfather was on an archery team for many years, and was left handed. I recently was gifted his bow, but my husband said he can’t use it because it is left handed. I can’t use it because the draw weight is too strong for me as well as being too big for me. However, it is perfect for my son, and my grandfather would be thrilled that his great grandson would be putting it to such good use. My grandfather would also be laughing and marveling at me being out on a farm. Another tear tries to leave me and I go back in the house to finish dinner. Chores are done, dinner is eaten, girls are playing with puppies, the boys are shooting arrows, and my husband and I go for a walk and I show him all of the animals and buildings and tell him about my day. I have missed our morning coffee talks and the night time of listening to the frog concerts out on our pond. We walk down the gravel road and stare up at the moon. It is so bright against the pink and purple sky at dusk with rolling hills as a backdrop. For a few moments I feel as if I am in a painting, and a beautiful one at that. It’s time for my husband and son to leave. I send them off with hugs, I love you’s and a bunch of eggs. I watch them leave as a dust trail on the gravel road. As I wave goodbye, my grandmother comes to my mind. I think about what she must have felt every time we left her home; an aching in the heart. Kitchen clean, eggs washed, laundry done, the girls and I spend the rest of the night painting while listening to pop music. Tonight I did a little canvas painting and then used origami paper and mod podge to create a little something to celebrate the full moon. When I walk into the bedroom, the whole room is filled with moonlight, and even though I am tired, I cannot help but gaze up at the bright light and give thanks for the day and for this opportunity. In a moment, I am asleep. I wake up at 5:30 to another beautiful and picturesque view straight ahead of me outside my window. Three days away from home and I am now starting to miss my morning coffee and conversation time with my husband. Our morning ritual consists of drinking coffee together talking and not talking about the day ahead, our observations of what is happening on our small small pond or in the news. I text him good morning, no response yet, though I expect one at 5:45 or so. I get dressed and head downstairs to make coffee. ​I still don’t completely have this coffee maker figured out and I really need a cup right now because I went to bed last night before washing the eggs. There are now over 2 dozen eggs to be scrubbed and washed and I need the wherewithal to do the task without breaking the eggs. ​How can something so fragile withstand being washed without breaking? I am in awe how fragile yet strong they are, the nutrition they provide, how good they feel in my hands. Every time I crack an egg into a bowl or pan I marvel out loud at the orange color of the yolks, like a sunset. It enhances my breakfast experience to be sure. Farm to table in real time, no grocery store. You literally walk into the barn, collect eggs and thank the hens as you eave. It’s only 6:30, I let the farm dogs out, cat comes up and meows at me, while chickens are running about the lawn and the cranes are honking. I still have time to walk around the property, drink coffee, and take pictures before needing to wake up the kids. Big farm dog comes with me; she is psychic and knows where I am going for our morning walks before I even finish the thought. I am thankful for her wisdom, killer instincts (there are coyotes out here), thick coat and eyes that remind me I have dogs at home. I take random pics along the way and decide to check on the cows out in the pasture. ​Big farm dog stays back a good 50 feet from the cows and watches me, waiting until I am ready to leave, but I am not sure why. Is it because she doesn’t like them or vice versa? Or is it because taking care of the cows is the cattle horse’s job and she takes care of the rest? She doesn’t want to intrude on cattle horse’s turf? No clue, and I can’t think of it anymore because I am now watching a calf nurse from its mother. Simple beauty not seen everyday though while I am on the farm, I get to go see it anytime I want. It is a beautiful sight to behold every single time. I wake up the kids and chores begin and go off without a hitch. I have to remind myself that today is Friday since the days and nights just fly by out here. It was an active day of taking the boy and his buddy to their fishing spot and heading into town with the girls. We ran errands and on the way home I decided to take a different way and the girls told me this was the way their mom always drove home. This route included gravel roads, okay entirely gravel roads! The gravel road was not too bad but it was hilly, lots of hills. One hill in particular was so high up that you could not see if cars were going to be coming over the hill until you were at the top. One of the girls started to freak out because she doesn’t like hills. Well… this was a first for me, and I did it without externally freaking out, while internally it was a bit thrilling and I was freaking out! In the rearview mirror I could see the dust trail that I was leaving behind me. The other thing that was behind me was fear. Funny how overcoming a steep gravel hill and not being able to see what was coming is so much like life, every single day. Well I started laughing at that and lost the ball but only temporarily. After dinner we played “keep away” again but this time outside, baked cookies, and ended the evening painting on mini canvases listening to pop music. Kitchen cleaned and laundry done I climb into bed and I am out like a light bathed in the moonlight. I wake up just before 5 am to the sun rising, birds singing and the Sandhill cranes honking out on the pond. I take a look out the window and see the landscape which makes me excited to get the coffee started so that I can sit outside on the deck, survey my surroundings and see what needs to be photographed. I come downstairs to make coffee but am confused by the coffee maker since I have been using a french press solely for the last several years. It is not comforting to be confused by a coffee maker especially when it is 5:15 in the morning and coffee is one of the first things on your mind. I eventually get it figured out and bless my husband for having ground the beans for me so that I am all set. I take my cup outside and let out the farm dogs, they are sleepy and take their time coming out to greet me. When they do come out I see in the behavior that they are looking at me as a food source provider along with their tail wagging. The bird chorus is still on and I am loving it, along with the fresh air and scenery. I sit down and the dogs join me, my coffee begins to kick in as does my curiosity when I notice that the female cat is asleep in the chair next to me. She opens one eye and then meows at me, she too sees me as a food source provider even though she is a great hunter and I have seen her freshly caught victims aka food. I continue to look around and it is so lovely everywhere I see that I don't seem to be able to sit still as my mind wants to photograph what I am seeing. I throw my camera on and walk about with coffee in hand. I snap a shot of the very shy and elusive cranes, and cedar waxwing birds. I need a telephoto lens, and this becomes a daily mantra for me while I am here. I take photos of peonies, Siberian irises, trees, sun coming through the trees, dogs, cats, and chickens scurrying around. A loud humming sound tells me that the hummingbird is at the feeder, I turn to watch and grab of few shots. Wandering around I see chickens pulling up worms and other tasty morsels and laugh at the site of chickens and all I can think of is that they are "free-ranging” it. The sheep and lambs are already out in one of the pastures and a few "mahs" are called out. I walk back over to the deck and attempt to sit down again and sip my now cold coffee. I look out at the land and wonder how long it would take for me to tire of this view, my mind tells me it I would not likely tire of it. I check in with myself and notice that I am feeling calm, no anxiety running through my brain or body, no concerns of carpool, no clients, no hospice patients. Nature relaxes me in a way that very few other things can and with all of this space around me I can just let go of everything and know that it will just dissipate into the air. The alarm is set for 9am which is when I wake the sleeping children for their farm chores. I wake them up one by one and there is no resistance yet. Off I go with the older girl to feed chickens, collect eggs, feed cats, and bottle feed a lamb. She tells me she is hesitant to open the barn door, so I open it and a huge chicken flies out and over our heads. That was a huge surprise and a bit alarming so we both looked at each other and then laughed. Now I see why she was hesitant since chickens are kinda big and feel even bigger when they fly inches over your head, I was just glad not to be pooped on! Older girl feeds the lamb and chickens, I take care of the feeding the Tom cats, and start looking for eggs. On this day I collected quite a few eggs in various places, some were still warm. The eggs feel so good in your hands and they are the color of light brown to light green and a pale white, unlike the pure white that you see in the grocery store. The color of the eggs is determined in part by the color of the chicken. These chickens are black, brown, red and a few with some white color in them. The grocery store white eggs are coming from white chickens. Next I se​t out to do chores with the younger girl and she has said that she will meet me by the puppies. Oh yes, the puppies, it is also one of her jobs to check on them. She tells me that she thinks their eyes will open very soon, and that it is the mother who licks at their eyes to help them open when the time is right. I hold each puppy and notice how different each one is, not only in coloring but in size and weight. The one thing they all have in common is their softness and warmth, as well as the squeaky and grunting sounds they make when they are nursing or clumping up together for a nap. Their days and nights are pretty much all about sleeping, eating and being irresistibly cute just by "being." The younger girl and I fill up buckets with water and we head out to the pig pasture area. It is a bit of a walk and the farm dog leads the way. Good thing too as I almost went over to the cow pasture which is a good realization for me that I still don't have a good grasp of the lay of the land. We bring some fruit for the sow and her piglets, they are excited to see us as it is feeding time and all kinds of grunting and snorting starts taking place. As I get their food ready, I notice that big farm dog is staring at one of the piglets face to face. They are clearly communicating with one another, big farm dog is taking in all the messages that piglet is sharing with her. I am fascinated by this, so much so that I spill some food onto the head of the sow and she could care less. Trying to feed the pigs is a bit chaotic as you cannot hardly get to put the food in before they are in there trying to eat as you put food in! Ugh! This is a mess! I need to devise a better plan for tomorrow. We fill up their water station and head back over to the kennel dogs and the boy. The boy is playing with all 4 dogs, they are running all over the place with lots of energy and social interaction with all of us. Belly rubs, ball chasing and tricks. The boy has been caring for these dogs for a large portion of his life. He is quite competent and knows the dogs and their behaviors. He also knows how to operate equipment, tools, hunt, and where things are including animals. I learn a lot from him everyday and see the value of being raised on farm where life is one big experience on a daily basis. Everything you need to know and learn about life is on a farm: Birth, death, growing, making mistakes, taking chances, careful planning, careless actions, fixing things, letting go of that which you cannot control, good times, hard times, loving and leaving, happiness and grieving. With chores done we head out to the pool and the afternoon flies by. Evening chores are done, dinner is accomplished and rice krispy treats are made and eaten. I have not had rice krispy treats for a VERY long time and while there is no nutritional value in them I admit that they tasted kinda good and brought back memories of my own childhood. I wash a 2nd load of towels a 2nd load of the dishwasher, shower and head to bed. The moon is so bright and is beaming on the bed. I move my pillow over so that I can bathe in the light of the moon and drink in the day. With one inhalation and exhalation I am asleep. 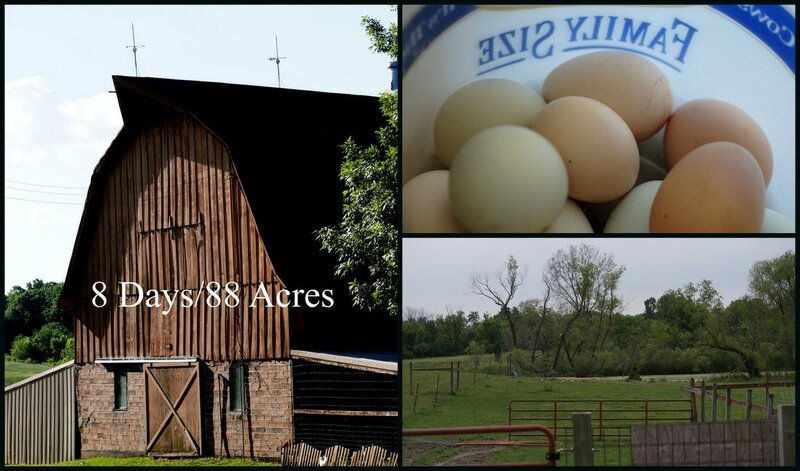 Ever since visiting my first farm as a young teen in Woodstock IL, I fell in love with farms and wanted to live on one. The land and wide open spaces made me feel very alive, connected and apart of something but I didn't know what that was at the time, let alone knew who I even was. Being basically a city girl from the suburbs of Chicago, the likelihood of me living on a farm was slim to none, so I let it just rest in my heart. Any opportunities that came to go to a farm I went and each time I connected with the land and wide open spaces. Both of my Mothers In Law had been raised on farms and I saw their work ethic, respect for nature and how living on wide open spaces made them very strong and competent women. Fast forward 40 years and my dear friend asked me if I would be interested in taking care of her farm and 3 of her 4 children for 8 days. I thought about it for about a nano second and in my heart I said yes, but my head won out and told her I would get back to her by the end of the weekend. I have never lived or worked on a farm but I think I would love it and it was on my bucket list to experience. Here was my chance! I processed the pros and cons, realizing that my husband and son would not be joining me due to school and work which meant I would be on my own. I was told the kids would do most of the chores and I would be responsible for collecting and washing the eggs as well as caring for four, 12 day old puppies. Who doesn't want to have to care for puppies? Duties would also include chauffeuring children to the pool, soccer, friends etc. As a parent of 4 kids, I have been there and done that and decided I could do this. As I leave behind my life in the suburbs the scenery changes and I am welcomed to southern Minnesota and all of her rolling hills, gravel roads, wide open spaces and farms scattered here and there. The sky seems bluer out here than in the cities and as I drive down their long gravel road, I am welcomed by "the" big farm dog Lucy and the other dog Chili. The dogs, kids, and my friends greet me and my loaded vehicle. I have 2 pairs of shoes for in the house, hiking shoes, and walking in the barn and muck boots which are a pair of 5 year old red sorrel snow boots that have seen better days and are well suited for the work ahead. I have art supplies and jewelry making supplies for things to do and make with the kids. I have packed enough changes of clothes so that I am prepared for falling into any kind of animal slop or poop. Books in a tote for quiet times, and I am armed with my favorite ground coffee: Dunn Bros. Guatemalan French Roast, sadly I realize I do not have a french press with me. I will survive without one. Right?!? As my friend and her husband continue packing and loading up the kids are showing me where things are, and of course we must see the puppies! There are 4 of them all girls whose eyes are still closed. Apparently the mother licks their eyes open when it is time. Who knew? The puppies army crawl around the whelping pen trying to stay either attached to their mother’s teat or clumping together with each other to keep warm. Part of my job is to hold these little creatures which are about the size of a small skein of yarn. I see that I will take this job seriously and will go on to holding them multiple times a day. Puppy therapy is a real thing! My friend and I go over the chores and contact information for everyone and everything in case any thing happens like the cows getting out or the sheep etc. I am hoping like all get out that neither of those things happen as cows are big! They say their goodbyes to the children and off they go leaving a cloud of gravel dust behind them. I am here with children who barely know me, and me who has somewhat of a clue, but not entirely, about what she has signed up for. I unpack and walk around getting myself familiar with things. Double checking the list of who does what chores as well as all of the activities that the kids need to be taken to over the next week. It is beautiful out here and I feel myself take a deep breath in the open air and try to take in with all of my senses the land, buildings, animals and me. Early evening chores take place without a hitch. I gather the eggs, and am shown where the chickens sometimes hide their eggs and walk with the two younger girls 9 & 11 to oversee and partake in the evening chores of checking on the water supply for the cows, pigs and lambs. We also join in with the boy 13 who is in charge of caring for the dogs who have their own kennel building. This means we not only have to play with the dogs while they get exercised but again we must hold puppies. I now understand the cartoonist Charles M. Schulz's book title: Happiness is a warm puppy. Puppies are warm, they nuzzle on your chest and sleep in your arms. This causes you to relax and your heart to melt, due to the sweetness of this simple act. Living life with self awareness and a sense of humor to get through it all.